"One night the tiger's paw got caught in an old tin can. Luka ran to see what the noise was. A TIGER? He gently pulled the tiger's giant paw from the can. 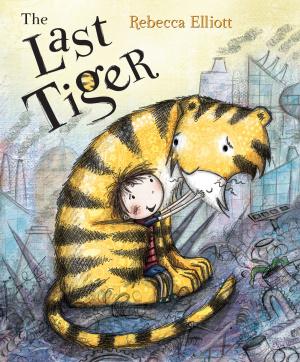 The tiger smiled, and nodded..."
Similar in style to her Kate Greenaway Medal nominated 'Zoo Girl', Rebecca Elliott's new story warns of what the future might hold if we neglect our care for the environment around us. Set in a world reduced to a rubbish dump by human carelessness, a little boy named Luka discovers the very last tiger. But where did the tiger come from? Through their adventure together, tiger and boy rediscover a natural way of living and lead the world to a new sustainable future. With striking illustrations crafted in ink line with a colourful collage effect, this thoughtful and uplifting picture book will make a lasting impression on your fives and above. Author Rebecca Elliott's book 'Zoo Girl' was highly commended by the Junior Magazine Design Awards in the Picture Book of the Year category, as well as shortlisted in the Most Promising New Talent category. With her history teacher husband and two children, the family live in Suffolk. The Last Tiger by Rebecca Elliott was published by Lion Hudson in July 2012 and is our 16726th best seller. The ISBN for The Last Tiger is 9780745963495. Be the first to review The Last Tiger! Got a question? No problem! Just click here to ask us about The Last Tiger. A:This book is for ages 3-7. Thank you for using the Q&A Forum. - When she was young, she had crushes on Jason Donovan, Patrick Swayze and then … Stephen Fry! - Rebecca is married to Matthew, a History Teacher. - Rebecca enjoys singing in pubs, not on her own but with her and her husband’s poppy/bluesy/jazzy/folky/souly covers trio - My Man Jeeves. - Just Because is sold all over the globe, in places like Italy, the U.S. and South Korea. In the Italian version, Clemmie changed her name to Martina! - She released 5 self illustrated and authored books in a single year. - Taken from Rebecca’s zany biography - “she was constructed over three decades ago by cosmic imps from radioactive moon dust, discarded artistic materials, twigs and a sack of potatoes … She now spends her earth hours protecting human younglings against the evil forces of The Patronising Giants of Alliteration and The Sinister Creatures of Anthropomorphia”.